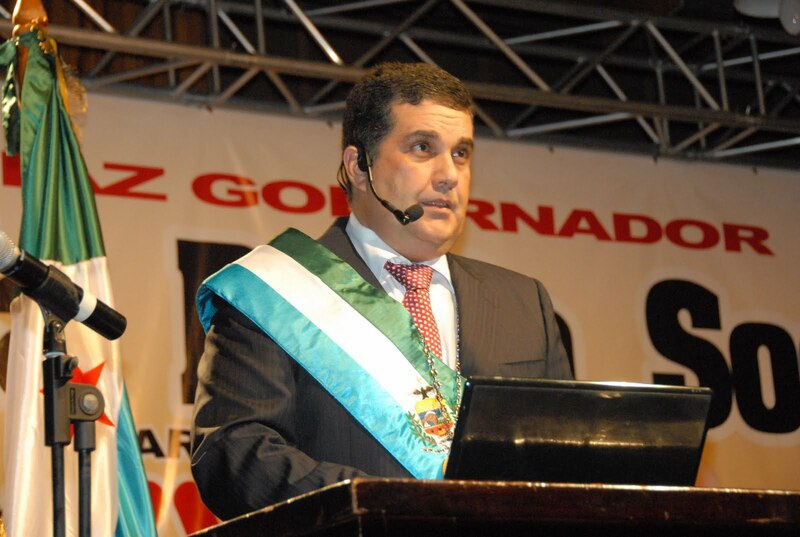 Merida State Governor Marcos Díaz Orellana is one of the six Chavista governors replaced for the 16-D election. One election is over but another one is around the corner: on December 16th, voters will vote for all State Governors and Legislative Councils. The MUD chose all its candidates months in advance, through its February 12th primary. With some exceptions like Carabobo, the list of candidates representing the PSUV and its allies was put on hold, as the Presidential Election came first. With Chávez’s re-election now confirmed, the clock was ticking for them as filing deadlines loomed. But they can breathe easier as the final results of the neurological primary (the one inside Chávez’s head) are now out. The highlight of the announcement is that six incumbent Chavista governors were dropped: Anzoátegui (Tarek William Saab), Aragua (Rafael Isea), Cojedes (Teodoro Bolívar), Guárico (Luis Gallardo), Mérida (Marcos Díaz Orellana) and Sucre (Enrique Maestre). In all but one of those states went red on October 7th. Their replacements are all current or former ministers: Interior Minister Tarek El Aissami will finally run in Aragua (he was the earlier choice for Tachira), former minister Ramón Rodríguez Chacín could take the place of late governor William Lara in Guarico and Aristóbulo Istúriz will run in Anzoátegui, very different from four years ago when he lost the race for Metropolitan Mayor of Caracas. But other questioned governors retained the confidence of the comandante presidente, as the cases of Francisco Rangel Gómez in Bolívar, Wilmar Castro Soteldo in Portuguesa or Hugo Cabezas in Trujillo. Matter of fact, 43% of Chavismo’s candidates are former military men. Another interesting choice was former head of the SENIAT Jose Gregorio Vielma Mora who was sent on a kamikaze mission to Tachira, possibly the opposition’s one truly safe seat in the country. The president’s brother will run again in Barinas while former Delta Amacuro governor Yelitza Santalella will run in Monagas (the only three-way race, including the dissident Chavista governor “El Gato” Briceño) instead of Diosdado Cabello and former VP Elias Jaua will face ex-presidential candidate Henrique Capriles in Miranda. The campaign for the 16-D election starts on November 1st. Here’s the list of State races.